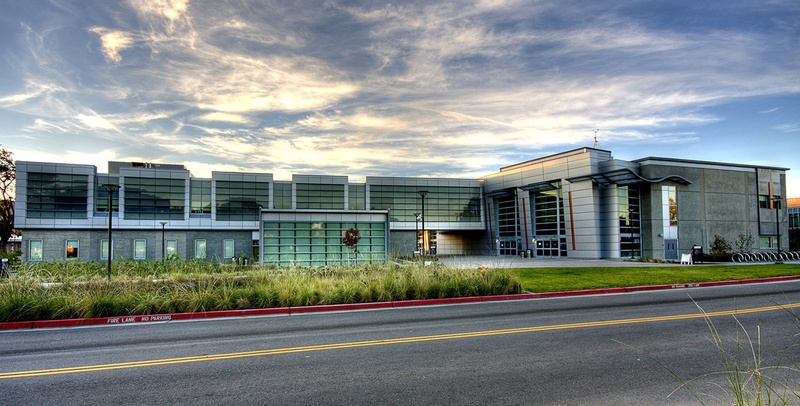 This facility is the gateway structure to the Chabot campus, and while the original goal was LEED Certification, it achieved LEED Platinum due to several sustainable features designed by Interface. The building includes the largest switchable glass design in America at the time of construction. The integration of the architecture and the switchable glass allowed the passive mechanical systems to be viable for the building. The facility houses general offices, financial aid office, community conference center, computer classrooms, break-out rooms, and open student areas. Several sustainable design features support its energy-efficient performance, including: natural ventilation, radiant heating and cooling slabs, variable volume diffusers, and a high percentage of daylighting.